I've been meaning to do a post about my makes for a couple of weeks, but as you can see, it didn't quite happen. My temperature blanket is on going, I must not rest on my laurels though, as I will find myself with a back-log of 'days' to catch up on. It does seem that the weather has brightened a lot, so it doesn't look like I'm going to get any freak lows (dark blues) unless I make them up! My wonderful hubby on his return from South Africa, well trained that he is, came back with two beautifully hand-dyed skeins of Merino...and a shawl pattern to go with.....now what more could a woman ask for....he knows what makes me smile! I finished the shawl yesterday and blocked it overnight. It's a simple small triangular shawl called Sunny Days Shawlette, designed by Carle' Dehning. 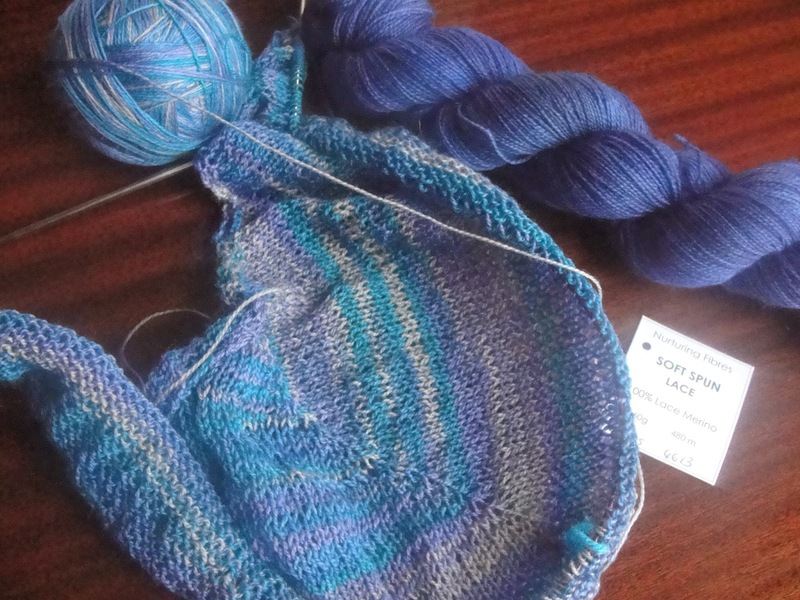 The shawl was made in her own Nuturing Fibres yarn in a blue/purple/turquoise colourway. 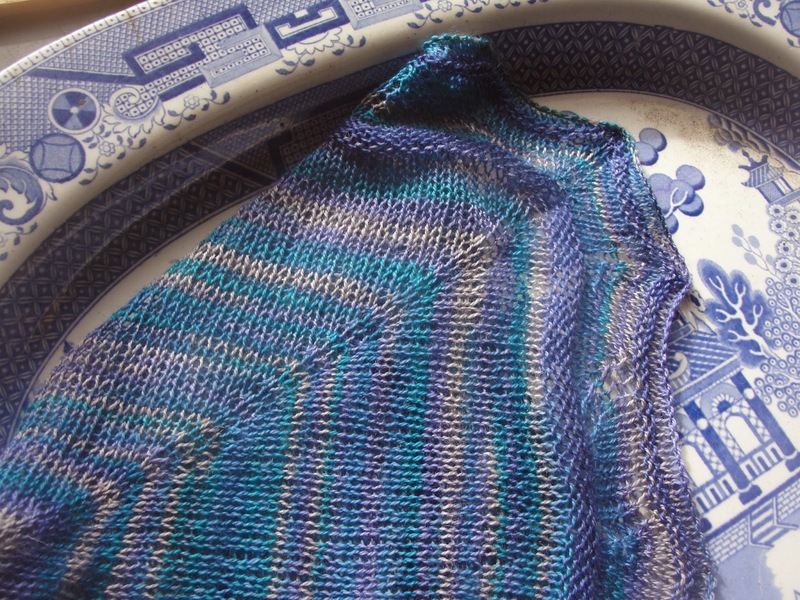 I used a darker blue for a couple of garter stitch rows at the end to accentuate the design. I'm not sure I had the whole of the pattern, as there had to be a bit of guess work at the end, but I'm pleased with the shawl, and the simple design sets of the colours perfectly. A few weeks ago, obviously when I was feeling a little chillier, I decided to make myself a Capucine, a lovely hat with bags of space for a big haired lady like myself! The design is worked from the rim up, and unfortunately that was my undoing! There's a lot to be said for something you can try on as you go....mine ended up being pretty big (even for me and my hair!). I have still got a pom-pom to put on and some plaits at the sides, but with the sudden cheeriness in the weather, I think it may well wait for another season. I was rather pleased with my more methodical approach and the finished costume. I made this with a cheap fleece blanket, and plenty of patience.....it is now in use as a warm onesie for bedtime.....I'm tempted to make one for myself! Anyway....I'm on to the next thing......another shawl wouldn't you know! I couldn't stop myself, although I made a concerted effort for a while there. I've decided to join in Sarah's (Crafts from the Cwtch) knit-a-long......more about that next week! To see other Year of Projects work, check out the ravelry page here. What great projects! I have been seeing everyone else's Miss Winkles and am sure yours will be just as beautiful! I read your last couple of posts and just have to say-amazing photos of the boys playing in the foam--what a wonderful thing to capture. And many congratulations on your long walk-I was wondering if it had already happened and I had just missed the post about it. In your last picture at the end, you still look amazing--one would never guess you would have a hard time getting up! Well done! 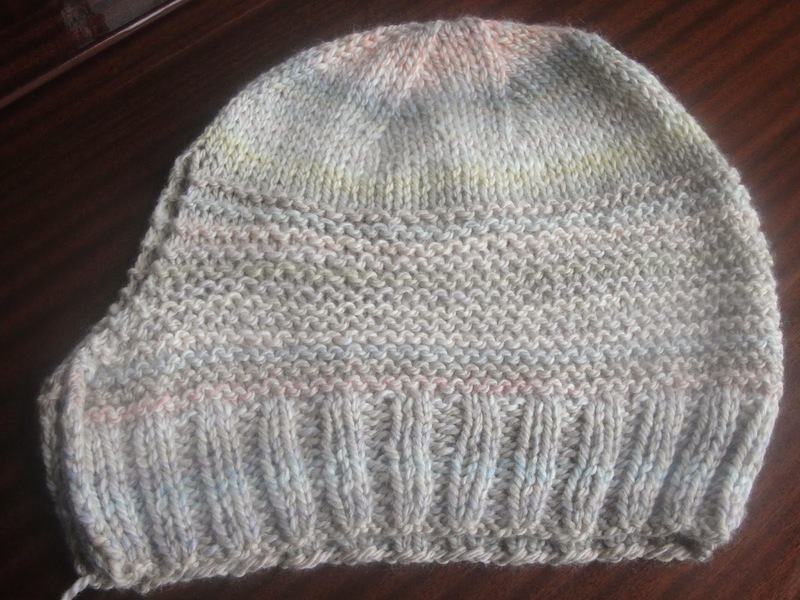 Your husband is a keeper - beautiful yarn AND a pattern! :) Such a lovely shawl as it made, too. I like the squonky ears on the teddy ... and Littlest looks delicious (and warm) in his costume. What great projects but the shawl with the yarn just steals the show for me. What an awesome present to get. Your going to love Miss Winkle it's a great shawl. You have one diamond of a hubby there Faith! What very beautiful yarn, reminds me of the colours of Cape point ocean, just perfect for displaying all it's glory in a shawl as you have done. Really special. 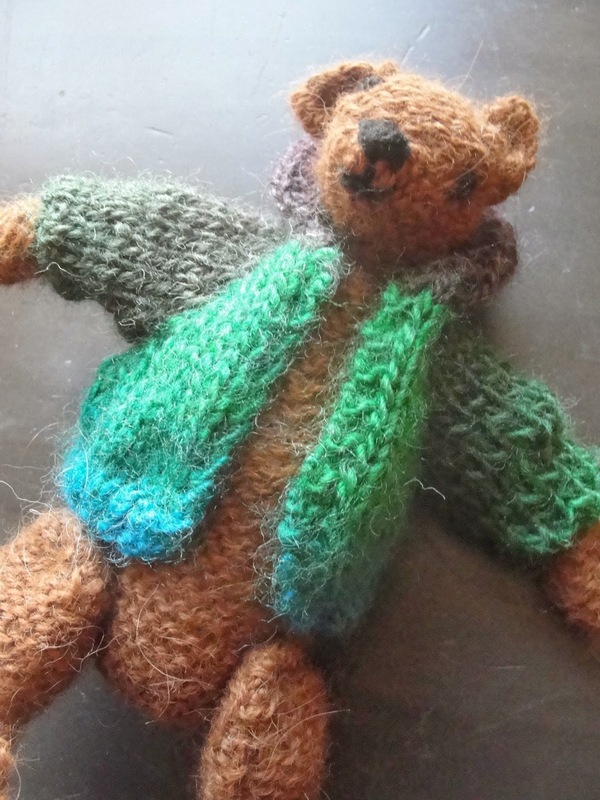 Your teddy, is too sweet as is your little lad being a super scrummy gingerbread man xox Hope you have a great week ahead lovely Faith. Man, that is one awesome husband you have. Bringin' yarn back for his wife; can't beat that. The costume is fun and sweet. I love pom pom hats. They are so fun. The shawl looks great.